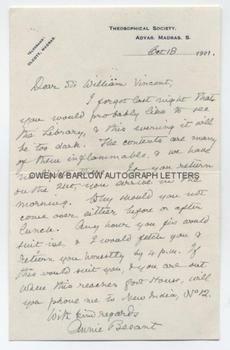 ANNIE BESANT Autograph Letter Signed. British (English) socialist, theosophist, women's rights campaigner and Indian congresswoman and Home Rule activist. ALS. 1p. Theosophical Society, Adyar, Madras. October 18th 1921. To Sir William Vincent. "I forgot last night that you would probably like to see the Library, & this evening it will be too dark. The contents are many of them inflammable, & we have no lights there. If you return on the 21st, you arrive in the morning. Why should you not come over either before or after lunch. Any hour you fix would suit me, & I would fetch you & return you honestly by 4 p.m. If this would suit you, & you are out when this reaches Govt. House, will you phone me to New India No.12". Annie Besant was married at 19 to Frank Besant but the couple separated over religious differences. Annie threw herself into secular politics, becoming a prominent writer and speaker for the National Secular Society. In 1877, with her associate Charles Bradlaugh, she was prosecuted for publishing a book on birth control. She was involved with the early establishment of Trade Unions, being one of the organisers of the London Match Girls strike of 1888 and the Bloody Sunday demonstrations. Annie Besant was a member of the Fabian Society (where she was romantically involved with the young George Bernard Shaw) and the Marxist Social Democratic Federation (with the artist William Morris). In 1890, after meeting Helen Blavatsky, she became increasingly interested in Theosophy, becoming the president of the Theosophical Society in 1907. She travelled widely, establishing Theosophist Lodges in many parts of the British Empire, before settling in India. Here, she joined the Indian National Congress and became editor of the New India newspaper. She campaigned against British colonial rule and in 1916 launched the Home Rule League. She was arrested and imprisoned and became a focus for the Indian Home Rule Movement. Gandhi was one of those who demanded her release. Nehru, too, was one of her supporters (he had been educated by one of Besant's theosophist tutors). Annie Besant spent the remainder of her life campaigning for Indian independence.